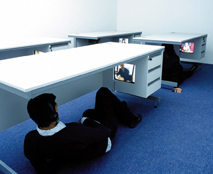 Saki Satom, Desk Project, 2005. Video installation. Photo by Michael Franke. Courtesy of the artist. No Time to Lose was a response to the systemic decline of personal time being experienced by people in various parts of the world due to increased hours spent working. Through an exhibition and program of events, it drew attention to the unsustainability of social and economic systems that do not afford people sufficient time outside of work. It also addressed the individual and civic costs associated with insufficient time to attend to health, relationships, community, and politics. No Time to Lose was envisioned as a contribution to global efforts directed at motivating and mobilizing people to trust their instincts and take back their time. As such, it featured artwork that encouraged audiences to disengage from their stressful routines and consider what they were losing because of an unbalanced lifestyle. Additionally, projects suggested how individuals might be able to make changes for the better. The tone of the exhibition conveyed a careful balance between conceptual engagement and motivational empowerment tempered with a good sense of humor. No Time to Lose sought to facilitate participation for a range of audiences. For example, gallery visitors had the chance to engage in exploration and conversation, while unsuspecting individuals could experience moments of difference by encountering performance and/or installation-based interventions deployed in public spaces. Audiences from other distant cities were also be able to participate through online forums designed to foster solidarity across geographical borders. No Time to Lose offered new and recent work by international artists. Featured media included performance, installation, video, and new media, as well as interdisciplinary and collaborative projects. Plus a special one-night screening of video by: Coleen Finlayson & Cherie Moses (Canada), Leila Sujir (India/Canada), Kika Thorne (Canada), and Emily Vey Duke & Cooper Battersby (Canada/USA). This exhibition was generously supported by: The Scottish Arts Council, Aberdeen City Council, The Henry Moore Foundation, the Canada Council for the Arts, Van Lier Fellowship, The City University of New York, and The Hangar (Barcelona).